We’re on the cusp of the seminal month of every college football season: Inevitably, November is the time of year when loose assumptions begin to harden into a formal pecking order, whether or not any definitive order has actually emerged. And this year, the order will be more formal than ever. On Tuesday evening, white smoke will emerge from a random hotel suite, and the selection committee for the College Football Playoff will reveal to great fanfare its first weekly poll of the season, triggering the requisite dismay from fans who don’t see their team in or around the top four. As rough drafts go, it’s going to be kind of a blockbuster. But the committee doesn’t know anything we don’t know, and with each passing week it becomes a little clearer how vast our collective ignorance really is. If we’ve learned anything in the past two months, it’s how little the 2014 season is shaping up like we imagined it would in the summer, and how little the prevailing order predicts what winds up happening on a given weekend. How can anyone go about projecting the top four teams in the nation on the first weekend of December when the “best” teams keep getting relegated to the scrap heap in the meantime? So far, the auditions for even one complete, clearly championship-caliber squad have come up empty. No team is ever perfect, but this year, no team is even close. This week, we gather to mark the end of Ole Miss’s undefeated season at the hands of LSU, and with it the last chance for a truly complete front-runner to emerge from the pack. Before their 10-7 loss in Baton Rouge, the Rebels boasted the best defense in the nation, an aggressive, ball-hawking outfit that had forced more turnovers and yielded fewer points than any other team, with a perfectly competent offense that had proven itself to be opportunistic at worst. Ole Miss’s first seven games featured one heavyweight victory (a come-from-behind, 23-17 slugfest against Alabama) and six cruise-control wins by at least 15 points apiece. As other, more touted contenders bit the dust en masse, Hugh Freeze’s side emerged as a well-heeled up-and-comer that had not only managed to adapt the classic Bama blueprint, but was actually executing it more successfully than the Tide. And in fact, when push came to shove Saturday night in a belligerent road environment, the vaunted Rebel defense held up its end of the bargain, forcing four LSU turnovers while keeping the Tigers out of the end zone until the 5:07 mark of the fourth quarter. By that point, though, the offense had long abandoned any pretense of competence — between Ole Miss’s only touchdown of the game, at the end of the first quarter, and LSU’s go-ahead score in the fourth, the Rebels punted on seven consecutive possessions, including four straight three-and-outs in the second half — and opportunism wasn’t in the forecast. After falling behind late, Ole Miss’s final, last-gasp drives resulted in a turnover on downs and a backbreaking interception, respectively,1 which was in perfect keeping with the rest of the evening. In its previous outings against ranked opponents, LSU’s defense had been trashed for 34 points against Mississippi State and 41 points against Auburn, yielding nearly 600 yards in both. At least the Tigers’ final stand on Saturday spared us a lot of hot air about grit, adversity, and destiny concerning an Ole Miss offense that spent the night drowning in its own trench. So scratch the Rebels from the list of prospective overlords. Now throw the list away. Who else do you even have on it? Nine weeks into the regular season, every ostensible contender has either lost a hand in the fighting or emerged with very visible scars. With six weeks to go, none of them seems particularly likely to make it through without incurring a few more. In the Power 5 conferences, only two undefeated teams remain: Mississippi State, which has allowed more yards per game than any SEC defense and still faces upcoming road trips to Alabama and Ole Miss, and Florida State, which has already escaped upset bids from Clemson and Notre Dame by the skin of its teeth. Among one-loss teams, Alabama has been inconsistent on offense; Auburn has allowed 73 points in its last two games; and Oregon just yielded 41 points to California, the fourth Pac-12 opponent to score at least 30 on the Ducks in five games. Notre Dame hasn’t beaten anyone ranked in the latest AP poll — the Fighting Irish’s “signature win” to date is their nail-biting loss at FSU — and Michigan State missed its only chance to transcend the Big Ten’s sinking rep with a 46-27 flop at Oregon. The top four teams in the Big 12 — TCU, Kansas State, Baylor, and Oklahoma — are barely distinguishable and appear determined to reduce one another’s houses to ashes. The Pac-12 South is a pit of vipers with no way out. After surveying the field, I’m almost tempted to jump onboard with Georgia, which has looked solid since its September 13 loss at South Carolina despite its reliance on a pedestrian quarterback and the extended absence of the best player in college football. Then again, UGA is coming off a bye week, and this is the kind of season that can start to make not playing look like a virtue simply because it means not losing. On the flip side, the complete breakdown of recognizable hierarchies has been a hell of a lot of fun to watch, and promises a lot more fun to come: Roughly two dozen teams still have a conceivable shot at landing in the four-team playoff field if they win out, including LSU, which was written off following a lopsided loss to Auburn on October 4; Ole Miss, which still boasts the stingiest defense in the nation; and probably four of the six teams in the Pac-12 South. Of the top 20 teams in the AP poll, only two (Florida State and Nebraska) will close out the month of November without facing another top-20 opponent. No team in that group has earned a cushion or left any margin for error. Every team is vulnerable in specific ways that have been successfully exploited. Whichever teams manage to limp away from the pack, there’s a good chance they’ll be defined as much by their weaknesses as by their strengths, and by how they managed to overcome the former. No. 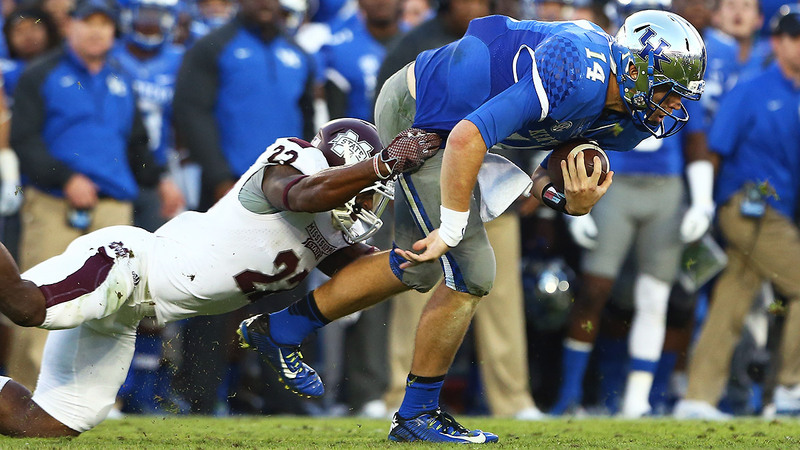 1 Mississippi State 45, Kentucky 31: I love Mississippi State’s offense, especially its spark plug/bowling ball of a tailback, Josh Robinson,2 and the Bulldogs continue to justify their place atop the polls by playing essentially the exact same game week-in and week-out. Consistency is everything, and MSU’s offense behind Robinson and quarterback Dak Prescott may be the most consistent unit in the country. That said, it was hard to watch Saturday’s game and not get the feeling the defense is a threat to blow up in the Bulldogs’ face at some point, just as Ole Miss’s offense fell apart against LSU. Kentucky is vastly improved under second-year head coach Mark Stoops, but not so improved that yielding 31 points on 504 yards of offense to the Wildcats isn’t a concern: That marked Kentucky’s season high for yards against an FBS opponent, and more than doubled last week’s output (217 yards) in a 41-3 debacle in Baton Rouge. 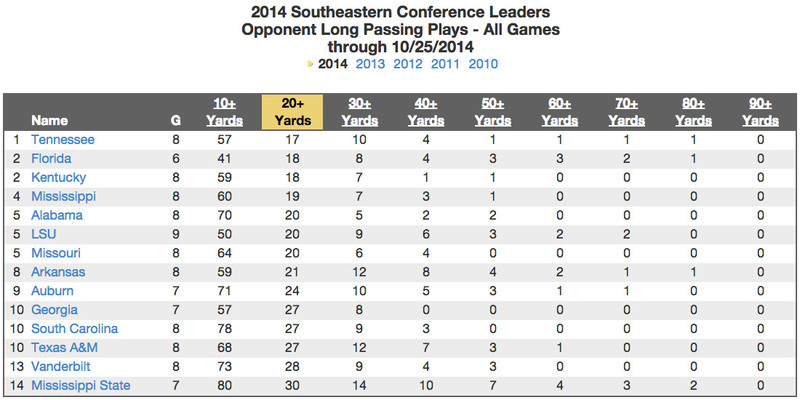 … and that poses an obstacle to the Bulldogs’ long-term staying power at no. 1. No. 10 TCU 82, Texas Tech 27: Welp. I think it’s fair to declare the offseason overhaul of TCU’s offense a success. The Horned Frogs set the Big 12 scoring record in this game, which is a hell of a mark to own in a conference known primarily for outrageous offenses. They also consumed the entire fireworks budget in one afternoon. Attempting to run down the statistical superlatives in a performance like this is futile — in sum, TCU passed for 480 yards, ran for 305, and scored on 14 of 16 offensive possessions — and I know that at least half of you have already dismissed the most prolific box score in conference history as an insubstantial sideshow, anyway. Like, who couldn’t score 82 points against Texas Tech if they were really trying, am I right? For the sake of comparison, though, consider that in 2013, TCU only managed 10 points against Texas Tech in a deflating loss in Lubbock, and went on to average a little shy of 24 points on 340 yards per game against FBS opponents; the Frogs ranked next to last in the conference in both categories en route to their first losing season in a decade. After this weekend’s outburst, the 2014 Frogs rank no. 1 nationally in total offense, no. 1 in scoring, and no. 5 in yards per play, putting them right alongside Baylor as progenitors of the most gonzo attacks in the sport.3 Still, no matter what else happens the rest of the season, the defense is going to have to answer for allowing the Bears to score 24 points in the final 11 minutes back on October 11. No. 19 Utah 24, no. 20 USC 21: Last week, I made a point of defending the decisive pass interference penalty that cost Notre Dame an upset against Florida State, which didn’t really need defending because (despite Brian Kelly’s protestations to the contrary) the call on the field was 100 percent correct. 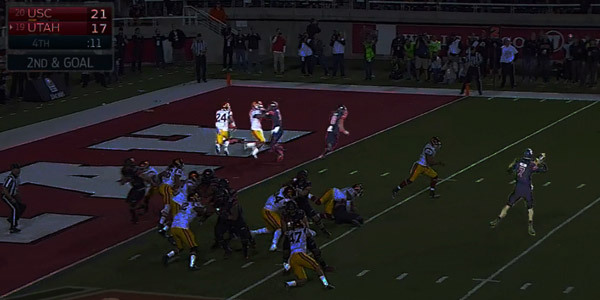 Still, because I singled out that play, and because it wound up dominating last Monday’s Twitter conversation, I suppose I’m also obligated this week to point out that, yes, Utah’s last-second, game-winning touchdown pass from Travis Wilson to Kaelin Clay came on a nearly identical “pick play” at the goal line. Unlike last week, the penalty wasn’t flagged. Touchdown Utah, Utes move to 6-1 on the season, everyone drive home safely. Would this even bear mentioning if not for the handy context of the Notre Dame play? Probably not! As a general rule, complaining about the officials after the game is the epitome of grade school pettiness. (Although I’m willing to make exceptions if the call is egregious enough.) As much as we’re led to believe otherwise by the technicalities and quasi-legal jargon of officiating in the age of instant replay, officials occasionally getting stuff wrong comes with the territory. I think the officials in Tallahassee got it right; if they hadn’t, FSU fans might have been complaining instead, but it wouldn’t have moved me to view the result any differently. Deal with it. I think the officials in Salt Lake City got it wrong, but the outcome is the outcome. The ball was on the 1-yard line. 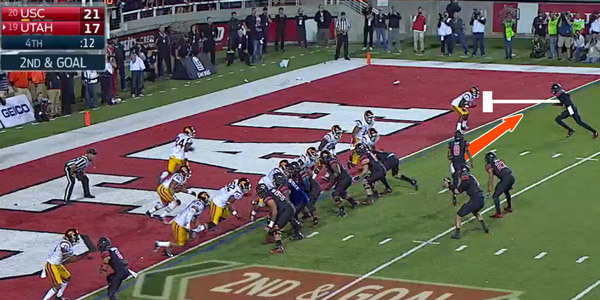 Utah had just seen an apparent touchdown overturned on replay, which could have gone either way. A little subjectivity on an obviously completed pass does not amount to a screwjob. It does, however, serve to highlight just how thin the margins have been in the Pac-12, where 16 of 29 conference games have been decided by seven points or fewer. Utah, especially, has thrived on the edge: The Utes’ late touchdown drive marked their third come-from-behind win in as many games, with the USC win following fourth-quarter comebacks to beat UCLA (in the final minute) and Oregon State (in overtime). Ironically, Utah’s only loss came when it blew a 13-point fourth-quarter lead to Washington State in the conference opener, a game ultimately decided by one point. Josh Robinson, RB, Mississippi State: Officially, Robinson is listed at 5-foot-9, 215 pounds,5 dimensions that can only be achieved by a human being who is (a) very obese, according to the National Institutes of Health, or (b) composed primarily of iridium, the second-densest element in the periodic table. Given that Robinson is a healthy, successful Division I athlete, I estimate him to be at least 80 percent iridium, which roughly corresponds to the ratio of attempted tackles he broke in the Bulldogs’ win over Kentucky. Robinson finished with 198 yards and two touchdowns on 8.6 yards per carry. Most of those yards (142 yards) came after contact, and roughly half of those yards came after he bowled over a tackler at the beginning of a 73-yard scoring run in the fourth quarter that can only be described as a “rumble.” Whenever Robinson gets around to running a 40-yard dash for pro scouts, he should be allowed to have, like, three or four guys randomly loitering on the track, just to make him feel at home. Leonard Fournette, RB, LSU: The five-star freshman ran so hard against Ole Miss that at one point the Rebels literally ripped Fournette’s face mask off the damn helmet in an effort to wrestle him down. Just ripped it right off. Consider the physics required to make that happen: A 220-pound linebacker grabbed hold of the cage, dropped to the ground so that the entire force of his weight was pulling downward on Fournette’s head — generating maximum torque, or whatever — and somehow the screws on the helmet gave way before Fournette’s neck did. He was “tackled” by the recoil, like the anchor in a game of tug-of-war when the rope breaks. The freshman pounded out 113 yards rushing (pounded is the right verb there) against a defense that had allowed just 97.1 yards per game on the ground in its first seven games. If there had been any doubt, he is who we thought he was. Joey Bosa, DE, Ohio State: Bosa was credited with six tackles and 2.5 sacks in the Buckeyes’ tight, 31-24 win over Penn State, including a game-clinching takedown in overtime, when he not-so-gently shoved Nittany Lion tailback Akeel Lynch into his own quarterback on fourth down. Mike Hull, LB, Penn State: In the same game, Hull was credited with 19 total tackles (seven solo, 12 assists) and 2.5 tackles for loss to go with a fourth-quarter interception that set up a short field for Penn State’s only offensive touchdown drive of regulation. In each of its previous four games, Ohio State had scored at least 50 points on at least 533 yards of offense; against the Nittany Lions, it managed just 17 points in regulation on a season-low 256 yards, at least temporarily stopping the J.T. Barrett bandwagon in its tracks even in a losing effort. If you’re wondering how a guard winds up throwing a legal touchdown pass to the guy who snapped him the ball, it took me a few viewings to get a handle on the formation here, too: At the snap, the Razorbacks had three “interior” linemen flanked by a couple of wingbacks6 and four more linemen set up wide, all on the line of scrimmage. The trick is that the center, D’Appollonio, is actually the last man on his end of the line, making him an eligible receiver; amid the confusion, UAB lost track of him, thereby facilitating the ultimate Fat Guy highlight of the year. Or, you know, don’t overthink it. Just revel in the fact that it happened. Pitt Drops the Ball. Pitt Drops the Ball. Pitt Drops the Ball … Pitt finished with 526 yards and 28 points against Georgia Tech, but it was too little, too late after the Panthers opened with arguably the worst five minutes of football in the history of the sport. Somehow — and I’m honestly not sure how this is possible — Pitt managed to lose five consecutive fumbles on its first five possessions of the game. Not five fumbles for the game. Five fumbles. On five consecutive possessions. In the first five minutes of the game. Specifically, the Panthers coughed the ball up on their second, third, fifth, sixth, and 13th plays from scrimmage, thereby tying the FBS record for lost fumbles in one quarter in a handful of plays. One of the fumbles came at the end of a 74-yard run by James Conner, resulting in a touchback; Georgia Tech subsequently scored three plays later on a 79-yard touchdown pass. So … yeah, it was that kind of day. Over the final 54 minutes, Pitt played the Yellow Jackets to a dead heat, 28-28. Unfortunately, that counted for little after the Jackets were spotted a 28-0 lead in the first six. The lapse wasn’t academic: Ohio State scored its first touchdown a few plays later after taking over at the Penn State 39-yard line. The officiating in Happy Valley was bizarre all the way around,7 but in 2014, how can every halfway-interested spectator be better equipped to make a key call than the people whose job it is to actually make it? Well, not quite. The worst case was what actually happened, which is that senior quarterback Bo Wallace neglected to throw the ball into the flat or to throw it out of bounds, instead opting to loft his first second-half interception of the season, into the waiting arms of LSU’s Ronald Martin. Wallace has had a terrific year, but given the context of the situation, it’s hard to overstate how bad this pass was. Only a few moments before, he’d had a virtually identical interception absolved by a defensive pass interference penalty that gave Ole Miss new life in LSU territory. With a game-tying field goal attempt in his pocket, Wallace’s first and second and last priorities on the final play were to keep the ball out of danger. Instead, he lobbed it directly into the spot that had already proven to be the most dangerous on the field. Dr. Bo, where did your mind go? More on the unruly finish below. In four conference games, TCU receivers are averaging 16.2 yards per catch; against Texas Tech, that number was 17.8. Notre Dame actually lined up in a trips formation, which required two receivers to run interference for the slot guy; Utah sent Clay in motion for a two-man pick. Though I’d guess he’s probably shorter and heavier. I’m using these terms in the loosest possible sense, because there’s nothing standard about this formation. On Penn State’s final drive of regulation, both head coaches were separately awarded timeouts that they did not call, among other snafus.